The ultimate ’80s hair rockers, Motley Crue graduated long ago from playing gritty Sunset Strip nightclubs. It’s hard to believe the band has been together for 33 years, but it has. And the members are finally calling it quits, labeling this a retirement tour and saying they’ve signed a cessation of touring agreement that bars them from ever touring under their brand name after 2015. Fittingly, Alice Cooper, whose blend of theatrical horror imagery and hard rock inspired dozens of bands like Crue, supports the band. Hollywood Bowl: 2301 N. Highland Ave., Hollywood. Tix: $33-$175. 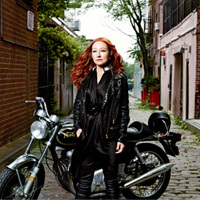 Tori Amos found success in the ’90s as part of a genre vaguely known as alternative rock. The term never quite described the actual music Amos made. Her releases have showcased her many talents—as a classically trained pianist, a vocalist, and a songwriter. She recently released her 14th studio album, Unrepentant Geraldines, which touches on her personal challenges. The Greek Theatre: 2700 N. Vermont Ave., Los Feliz. Tix: $44-$75. As part of the Downtown Stage Concert Series, held outdoors in Pershing Square, this week’s performers include ’80s New Wave band Missing Persons (“Walking In LA,” “Destination Unknown”). Joining the band will be Information Society, known for its “What’s On Your Mind (Pure Energy)” video. The group has been together and performing for over 25 years. Pershing Square: 532 S. Olive St., downtown. Tix: FREE.